Currently not taking any services! My name is Zach although online i'm mostly known as Goody or Thegoodybandit. Currently working towards an associates in IT and Computer Science. I've only been working with Java for around 3 years, but what I lack in long term experience I make up with knowing pretty much all there is to know about Ruse and how the file structure is set up. I can pretty much do whatever you might want although i'm not the best with client sided work. I am also not currently interested in re-writing drops or combat scripts or pathing right now. Whether it's content, skills, bugs, models, dupes, or interfaces i've added and removed a lot from the original ruse base and i've probably fixed your issue or added what you're looking for already. I'm not going to waste your time and if I can't do it i'll straight up tell you I can't complete the task. Leave your Skype or Discord below and I will send you a message. Alternatively you can send me a pm with your contact information if you would not like to leave it here. Willing to do small services for free in exchange for a vouch, but for continued work I would like to be paid. I don't charge a lot for the work that I do and most of the time I offer a "pay what you want" and both of us generally leave feeling satisfied. I won't steal/release your files and although I don't prefer it we could work over teamviewer or another remote desktop software. Bosses I can add with full animations - Cerberus, Lizard Shaman, Abyssal Sire, Skotizo, Barrelchest, Unholy CurseBreaker, and Thermo Smoke Devil. More if you have the models and animations. Vouch for this guys realy does a good job and trustworthy. Vouch for goody, worked with him and he is 100% trustworthy. Quite fast for getting the job done aswell. Vouch, friendly guy - very easy to communicate with! Vouch for goody, did some work for me and was rather quick. Well what i can i say, top guy to be fair. Most coders/developers i know are not all that nice, just want the money and to get out of there. This guy seems to enjoy helping and if not just for a thanks or vouch he is happy with whatever 'donation' aka payment he receives. Personally, i recommend using his services. HUUUUUUUGE vouch for Goody. This dude is one of the few people you can count on and trust when you've never met him. He helped me with no problem, got what I needed done super quick and was kind as all get out. Will DEFINITELY be using this guy for any help I may need in the future! Thankyou Goody! Vouche for Goody, Currently working on a few things and is easy to work with. Absolute HUGE vouch for Goody. This guy's in school working on his own server, and trying to include a social life (joking) and still found the time to sit and talk to me for hours today, helping me with problems. You don't find many, if any people like this to willingly just sit and help with question after question while still finding time to work on his own projects, etc. Thank you so much Goody, you're the man. -Helped me learn how to use a sprite packer, which I had never used before. -Helped me with errors that weren't as simple to me, but were simple to him and I now know how to fix these errors myself. -Also explained to me how important it is to ALWAYS back up things you may think you'll accidentally delete, cause that happened to me and I thought I was done for. Thank you again Goody, I wish you the best of luck on your server, in real life things you have going on. 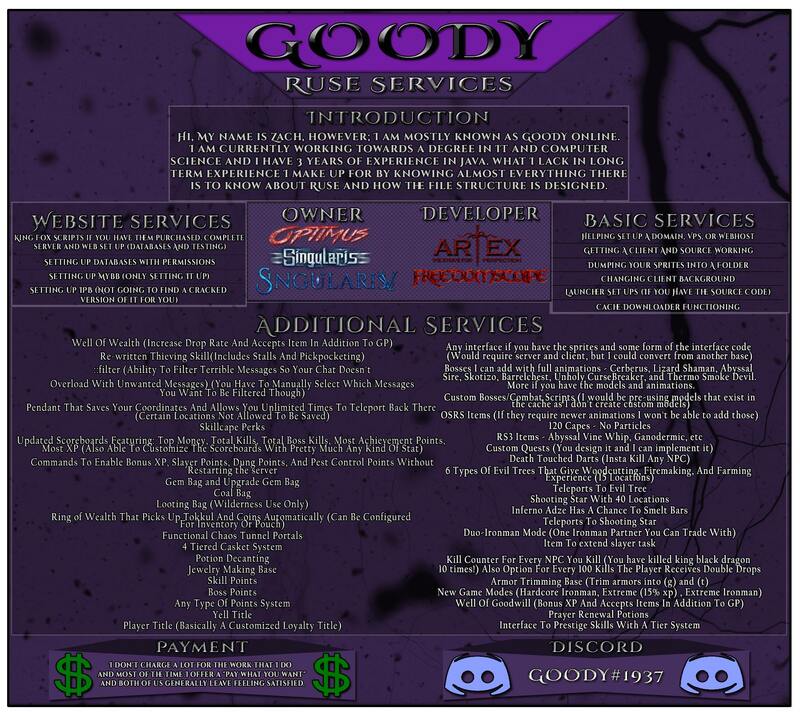 I haven't purchased these services from Goody but have had financial transactions with him in the past (and continue to do so). He's one of the few people throughout this website who's personality shows through their social profiles(discord and the like). He's never demanding or impatient, and is always happy to assist and aid. All in all, I'd happily recommend users to purchase services from him as based off the above vouches he clearly acts the same with everyone. If you're on a budget and wanting to deal with a friendly guy, I'd wholeheartedly point you to Goody! Zach is very knowledgeable, and very good at explaining things as well as being a nice person in general! Personal vouch for Goody. I've used him once on a server I attempted to run, however, ever since then he and I have remained friends and have done transactions back and forth in regards to other means. Vouch big time, known goody for a few years now. Always extremely helpful and 100% trusted. Goody is always there in a time of doubt. Fast reliable and friendly. One of the best guys I know! He will do what it takes to make something actually work, Not just slap it on quick and leave you to clean up the rest. I would refer him to anyone for services! glws goody! Goody was extremely quick in the service he provided! I could not be more happy! 10/10 will be using him in the very near future! Goody was very helpful. He answered all of my questions and performed his service within minutes. He is extremely knowledgeable. This man knows what he's doing! Vouch for Goody! He fixed some errors on server, great guy and professional! Massive vouch for Goody, clearly knows exactly what he's doing and is very trustworthy. He helped me out with 4 problems that I had and even explained how to go about creating minigames. Definitely will be buying from him in the future if I ever need work done, great guy thanks again Goody . Vouch for this man works fast and knows what hes doing. Vouch, he knows what he's doing and has to do also very cooperative and friendly person to work with ! Very good developer, worth the purchase we use him on our server blade RSPS, and we are very satisfied. As well as the fact that he does a good job as a developer he also has very reasonable price for the work he does. Huge vouch from me and all of the Blade Staff. Vouch for my guy Goody, goes above and beyond with his services. Would highly recommend!! Vouch for Zack helped me out with a few things! big vouch! Vouch, very helpful and friendly! Vouch, really helpful person, really often has time to help me, even when i say 5mins and its 1h, hes still ready to help me, amazing guy. He helped me with my drop table, and implemented a brand new one in for me, Very fast and reliable and would 100% use him if i ever needed help again. Another quick vouch for my buddy, helped me a lot with adding Callisto. Appreciate it. Wish him nothing but goodluck! Last edited by Goody; 01-27-2018 at 09:49 PM. need help simplicity ruse based. My name is Zach although online i'm mostly known as Goody or Thegoodybandit. I've only been working with Java for a couple years, but what I lack in long term experience I make up with knowing pretty much all there is to know about Ruse and how the file structure is set up. I can pretty much do whatever you might want although i'm not the best with client sided work. I am also not currently interested in re-writing drops or combat scripts right now. I won't steal your files and although I don't prefer it we could work over teamviewer or another remote desktop software. Currently doing small services for free to get up my vouches. Yes free, but don't think i'm going to change and update a million things for free. After a certain point of helping out I would like to receive payment for continue work. After I think I have enough vouches it will no longer be free and I will update the post. Couldn't find your Skype so I added you on Discord. Need cape particles fixed if you have any knowledge on this. That's a nice thing you're doing here, free services for who cannot code and doesn't want to learn programming by theirselves. But it's a bit contraditory posting 'free services' in 'selling' section, that would be better in the helping section on RuneScape development. I wish all the best to you and good lucky with your career in IT, that's a really complex section which you'll have something new to learn each day, that's why it's so great! Edit: and instead of just doing for the Ruse framework, do for every framework, that's all java. Website Services - You name it I do it.